For over twenty years, I have stayed in the same 20-pound weight range. I’ve tried a variety of diets and exercise regimens, but nothing has ever moved me out of that range, nor have any of them ever become a long-term lifestyle. I had convinced myself that I simply had a stocky build, and, in fact, had a sense of pride about my larger size. And I believed that I was much healthier than I actually was. Then, a little less than a year ago, I was confronted with the realization that I was very overweight, out of shape, and unhealthy. My doctor had needed to prescribe medications to treat the effects of my poor health, and a family member had confronted me on my overeating. I realized that I was endangering not only my only life, but also the care and well-being of my family. It was then that I embarked on a journey that (literally) changed me into a different person. I changed some of my eating behaviors, incorporated several tools to help me maintain a daily awareness, and gradually implemented moderate exercise. 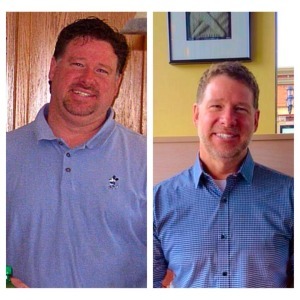 The results shocked me – I consistently lost several pounds a week, losing a total of 50 pounds in just under four months to reach my goal weight, and have since maintained my goal weight for six months. My greatest moment of joy came when I was able to once again wear the leather bomber jacket that my wife had given me at our wedding 26 years ago. As I traveled along this journey, I began to identify reasons why I was succeeding this time, when I had tried so many times before without the same results. There were certain, specific behaviors that I came to believe were important to my success, that kept me going and produced consistent results. After I achieved my goal and reflected back on those behaviors, I realized that, not only did they help me accomplish that weight-loss goal, but they also represented some very valuable and practical lessons on leadership. Everyone wants to know your secret. After it starting becoming noticeable that I was losing weight, most people would ask me one question when they saw me: “What are doing to lose weight?” (usually also followed with, “Is it on purpose?”). Why were they asking this question? I believe generally for one of two reasons: 1) they were looking for a trick, something easy and simple that they could do to also lose weight, but without a lot of effort, and thought that perhaps I had discovered that trick; or 2) they wanted to know what I had done so that they could do exactly the same thing and get the same results. The reality is, there was no trick, and everyone is different, so what I had done would not necessarily work the same way for someone else. The same idea is true in leadership. I think that people often read books or attend seminars so they can copy someone else’s pattern in every detail, or so that they can uncover the secret that no one else knows about. But there is no secret. Leadership is not a hidden, secret society that you are trying to uncover. And also remember, you are a unique individual, so your leadership practice should reflect you, your personality, and your strengths. The truth is, if you try to be someone else, you are not being authentic and genuine. There are only a few core behaviors. My weight loss and fitness really boiled down to diet, exercise, and a handful of core behaviors. Medical research has clearly shown that the most effective weight loss programs involve healthy diet and exercise (my wife would often tell me it was 80/20 – 80% diet and 20% exercise), and I had read a study that showed that people who lost a significant amount of weight and kept it off for more than five years all share some common behaviors: they ate breakfast, they weighed themselves daily, and they had exercise equipment at home. Students of statistics or psychology know that correlation does not mean causation, so no one believes that something like weighing yourself daily causes weight loss, but those core behaviors are important because they reflect certain patterns and thought processes that bring about the change (like, maintaining constant awareness of progress, both daily and weekly). So, I focused on several core behaviors, beginning with making better food choices – like eliminating soft drinks and excessive snack foods, measuring portions, counting calories, eating more fruits and vegetables, preparing fresh meals – and exercising in moderation – I started with nothing more than walking on a treadmill for four minutes, three times a week, and doing a few sit-ups and push-ups, and very gradually increased the amounts over time. I weighed myself every day, and I ate breakfast every morning. And then I found another behavior that worked for me (it was an idea that came from my children): I filled a clear glass with 50 marbles (one for each pound), set an empty glass next to it, and for every pound I lost, I moved a marble from one glass to the other so I could have a visual picture of the change as it happened. And the result was consistent, noticeable weight loss. Again, the same is true for leadership. There are lots of principles, theories, and ideas on leadership; far too many for any one person to use. But there are certain core principles and behaviors that show up in leadership research over and over. Behaviors like modeling, demonstrating integrity, empowering and equipping people, and identifying and using strengths. Part of your role is to understand and apply those core behaviors, and to use them in a way that matches who you are. Then you can determine what other leadership behaviors, in addition to those few core behaviors, would best work for you and most enhance the effectiveness of your leadership. Don’t try to be and do everything, because you can’t, and it won’t work. It requires discipline and effort (and sometimes you’re hungry and tired, and want to quit). As I have already said, there was no simple trick to my weight loss and fitness change. It took hard work. There were nights that I would lay down to go to sleep, and my stomach would start to growl (especially early in the process), and I wanted to get up and eat, and it took discipline to withstand that feeling. There were times that I had to very consciously work at not snacking for the sake of snacking. Some days, I was tired and didn’t want to walk on the treadmill. But in the end, probably the most important thing I did was to keep moving forward, exercising when I didn’t feel like it, and resisting the urge to eat when and what I shouldn’t. Likewise, leadership is not easy. It requires discipline and effort to put others first, to make hard decisions, to motivate others, to accept responsibility for mistakes, to implement changes, to handle criticism, and to take on other challenging tasks and roles. There are times when you want to quit, or (metaphorically speaking) when you have to go hungry. What do you do then? If you are a leader, you must steel yourself to keep going, to not give in to those pressures. Keep doing what needs to be done. Keep leading, and keep leading in the right way. Moderation is essential. Let me be honest –I do not enjoy exercise. Over the last 20 years, I’ve tried some kind of running regimen a few times, but it typically hasn’t taken more than a couple of weeks for me to question the sanity of voluntary self-infliction of pain and exhaustion. Often, over the last few months, when people would ask me if I was exercising, I would say that I was, but that I was a firm believer in exercise in moderation. I knew that if jumped right in to an intensive workout routine, training for a half-marathon, I wouldn’t last two weeks. So I started with a little bit – four minutes of walking (not running) on a treadmill, three days a week, along with a few sit-ups and push-ups. Then, I made incremental improvements. Each week, I added two minutes to my time on the treadmill, and added a few more sit-ups and push-ups. By the time I reached my goal weight, I had very gradually worked up to 20 minutes on the treadmill, and a lot of sit-ups and push-ups. It worked because I didn’t overcommit at the beginning, I didn’t try to train like an Olympian, and I made incremental, manageable improvements. Effective leadership understands that moderation is a key to success. If you overcommit your energy and resources before you’ve built up stamina and strength, you will run out of gas. Be balanced in your approach. Make incremental adjustments (this is one of the principles that Jim Collins pointed out in Great by Choice). When you exercise moderation (pun intended), it’s much easier to build and maintain momentum. It needs to be enjoyable. I love the taste of food, and I definitely have a sweet tooth. It would not have been possible for me to keep going if my diet was tasteless and un-enjoyable, and if I was not able to have anything sweet. I know because I’ve tried. I’ve done the “no carb” thing, I’ve eaten rice cakes and cottage cheese, and I’ve tried a variety of diets that I couldn’t keep. This time, I did eliminate unhealthy and artificial products, but I also ate food that tasted good and treated myself with some things that I thoroughly enjoy, but I ate them in moderation (see point 4, above). I drank my Latin coffee – café con leche – with milk and sugar (3 teaspoons) every morning; I ate a small piece or two of chocolate every night; I cooked fresh, flavorful dinners with healthy ingredients, but with portion control; I occasionally (once a week) had a small serving of dessert or a couple of slices of pizza. I ate food that I could enjoy eating, and allowed myself rewards and treats because I knew that denying them completely would likely result in overindulgence if, or when, I gave in. In the same way, the work of leadership needs to be enjoyable. That doesn’t mean that it will easy; we’ve already established that it takes discipline and hard work. But if you are not enjoying it and you are not getting some periodic rewards, it may be time to stop and ask if you are doing the right thing. You should be able to see and experience rewards and accomplishments along the way. You should be getting a sense of satisfaction from the work you are doing. So you need to find enjoyment in it, and you need to provide rewards along the way. There’s another lesson I learned, a bonus lesson, but it’s not actually a separate lesson; rather, it is a lesson that is woven through the other five. The bonus lesson is this: It has to be sustainable. All the work I had done would have been fruitless if, six months later, it was not something I could have maintained. Think about this idea in the context of the previous five lessons: you cannot consistently be someone you are not, so in order to be sustainable, your leadership style and practice has to match you; the more complex you make leadership, the more difficult it is to maintain and sustain, so you need to keep it as simple as is practically possible, focusing on core behaviors; leadership requires work not only to start and maintain for the short-term, but also to sustain in the long-term; because it is not a quick process, it requires step-by-step, incremental improvements and moderation to be sustainable (it’s more like a marathon than a sprint); and if I am not getting any enjoyment out of it, eventually I’ll stop. Therefore these five lessons, and the ideas they represent, have to be applied in a way that makes them sustainable. Don’t try to do things in a way that you can’t keep up, because you won’t. I am in a much healthier place in my life now (take a look at the picture above to see what a difference four months can make). I have been able to work my way off all medication (with my doctor’s supervision, of course). I now have a different – and sustainable – way of eating that I enjoy but that is also much better for me. I have a regular exercise plan that I am able to maintain. I am better able to take care of my family and I feel so much better. I learned and implemented some life-long, lifestyle principles that will benefit me for the rest of my life. But along the way, I also found some principles that transfer to a healthy approach to leadership, and so in the end, this change in my life has also made me a better leader. Thanks, Matt, and a great point. Personal life experiences often make great illustrations of spiritual lessons and disciplines.